Just two decades ago, during the early to late 90's, when the western world talked about email, there was only one brand that rang the bell, AOL (America Online). "You got mail!" the digital voice echoes in the room, to the delight of the email user of the 90's. All goes to show that in the early days of the "civilianization" of email, it was controlled at least by just one company. The term "civilianization" refers to the fact that before wide public access ti the Internet and its one of its earliest service, email - it was a by-product of military innovation. In the 90's, companies that offer an email service had a cut-throat competition with which one of them will become the "standard." The competition was so fierce, to a point that an email coming from an AOL user can only be sent and received by an AOL user. This same true with CompuServe, the emails from their domain can only be sent and received by a fellow subscriber of the mentioned service. The situation of the email systems in the 90's was very similar to how social media sites of today are independent of one another, a post in Facebook stays in Facebook unless the user has a Twitter account as well and choose to cross-post her content in it. Desktop Email clients have received a major change with the adoption of IMAP (Internet Message Access Protocol), replacing the aging POP (Post Office Protocol). IMAP was the standard with webmail, and email clients adopting the same protocol created a homogeneous platform for user's email regardless of the service provider they sign-up with. At this point of webmail's history is the start of the strong intervention of service providers in combating spam emails. 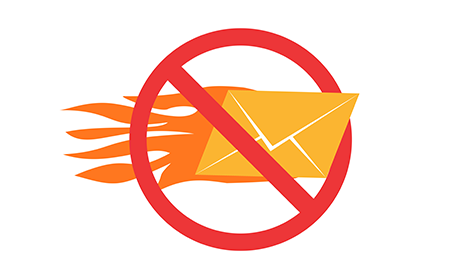 The anti spam system that was born out of necessity is the "Junk" button, where users can choose to mark an undesirable email as "Junk", and it will be quarantined from the rest of the mailbox. The next stage in the evolution of the email is the growth of mobile computing. Riding on the popularity of the Blackberry platform, the businessmen's favorite mobile device vendor, email-on-the-go has entered the mainstream. Email has become a bigger brother of SMS messaging, as the dividing line of SMS and email was blurred, as emails sent through a Blackberry's data connection became instantaneous communication tool similar to SMS. With the help of Blackberry's signature physical keyboards on their mobile phones, composing an email can be done anywhere regardless of length. Blackberry failed to remain relevant in the mobile market, and gradually became a relic of the past. The Android and iOS platforms became standard in mobile computing, powered by virtual keyboards and keyboard swiping capabilities. Corporate and personal emails are less distinct from one another, as the Gmail app can connect to various email services including support for Microsoft Exchange. However, all of these massive changes in how people use emails through PC, smartphone and now smartwatches one enemy remain to be defeated - spam emails. Enterprise users can take advantage of corporate-strength anti spam systems installed by their respective companies. One such business anti spam system is launched by Comodo. A trusted name in privacy, security and anti spam system, Comodo Dome anti spam system is a multi-tier solution for fighting junk emails. Depending upon the requirement of the enterprise, Comodo Dome anti spam system is a business anti spam system solution which can be entirely cloud-based, hosted remotely, but connected to your mail server using a high speed network connection in your own office network itself. The anti spam system offered by Comodo does not add needless adverts which slow down the user's PC. Comodo Dome Anti Spam system isolates people from contacting dangerous content and prevents the people layer from being the most vulnerable layer in a company's anti spam system. Comodo Dome Anti Spam system runs independently from the workstations, it does not waste the limited computing resources like a software anti spam system with a questionable quality. Secure your enterprise, secure your future, choose Comodo Dome anti spam system versus other brands. The anti spam system used by your enterprise right now may not be able to cover the future requirement for corporate anti spam. Sign-up for a trial today!